You are here: Home / New York Women’s Suffrage Centennial Conference a Great Success! New York Women’s Suffrage Centennial Conference a Great Success! In addition to meeting and brain-storming with other Centennial enthusiasts we were also treated to a tour of the historic sites that Seneca Falls and Waterloo are famous for. 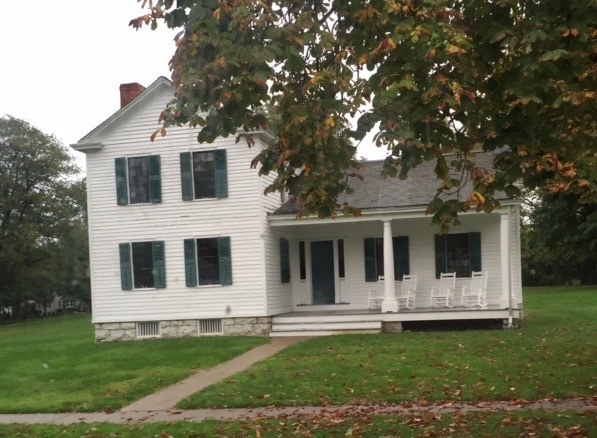 The Seneca Falls Historical Society was a warm and welcoming host, as were the National Park Service employees who offered tours of Elizabeth Cady Stanton’s house, (above) and the Women’s Rights National Historic Park, including the Wesleyan Chapel. For me the Wesleyan Chapel is the gol den treasure. When I visited a few years ago I was dismayed to see it had no full roof, and the historic brick walls were open to the elements. It was as if the world had forgotten the spot where the first women’s rights convention was held. But now, due to the Women’s Rights National Historic Park, it has a new, sturdy roof and four walls, all being protected and preser ved. To sit within those walls and imagine the ground-breaking work that went on there was for me a wonderful thrill. The spirits of those brave men and women who dared to demand political equality permeate the space, and one can’t help but be moved. The visitor’s center next door has also seen some work, with expanded exhibits and a welcoming staff. Wesleyan Chapel then, left, and now, right. We also toured the National Women’s Hall of Fame, which is holding its annual induction of ten new members this weekend. The Hall has run out of space, and is raising funds for a well-deserved new home. Since this is the Women’s Hall of Fame for our entire nation it is altogether fitting that it have a bigger, more significant space. Thanks to Spike Herzig and the New York Cultural Heritage Tourism Network for a great experience, and stay tuned for further developments on the Centennial celebration, and more information about these wonderful historic sites.